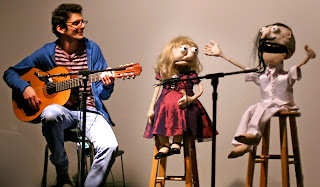 By Sabrina Khan, Senior Plogger The Princes of Persuasion: Recipes for Romance, a humorous musical performed by a cast of puppets and their human bandmate, is a one-of-a-kind show even for the New York International Fringe Festival. The stars of the show are the puppets Destiny, Linda, Domingo, and Lil’ Bo-tique; and their guitarist, Ithai. They begin the show even before the curtain rises, bickering loudly enough for the audience to hear, which instantly draws laughter from the crowd. The rest of the show is a like musical debate about each character’s perception – or recipe – of romance. Destiny understands it to be one thing, and it’s unlike what Linda thinks, or what Domingo feels, or even what Lil’ Bo-tique sees. Ithai simply listens and strums the guitar. The Princes of Persuasion: Recipes for Romance begins with a conversation about romance and goes off on random tangents that turn into songs. None of the songs relate to each other, but they are all quite funny. There is little plot to this musical (other than the central topic of romance, which you may soon forget), but it’s still an enjoyable show. The Princes of Persuasion: Recipes for Romance is a good time for all audiences, especially for young kids. Though it does include a song about “animal assholes,” it’s still fairly clean and fun to watch.